* Stanley Fish unexpectedly discovers academics are workers too. * Chris Christie takes a hit from the NJ courts. * Smart people who disagree with me about Libya: Juan Cole, Aaron Bady. …This is why Leon Wieseltier’s defense of the intervention is so infuriating. He mocks Ezra’s point on the relative benefits of spending money fighting Libya versus spending money fighting malaria, asking, “Did our inaction in Rwanda reduce the frequency of malaria in Africa?” The point seems to be that malaria eradication may be a better goal, but it’s not politically tenable, and in light of that, intervening in Libya is a good second-best option in humanitarian terms. * And Mother Jones has your list of Communists Muslims in the State department. Remain vigilant, citizens! Traitors are everywhere. Tagged with academia, austerity, Chris Christie, education, How the University Works, humanitarianism, Islamophobia, Libya, malaria, military interventionism, New Jersey, politics, Red Scare, Rwanda, Stanley Fish, unions, war, Won't somebody think of the children? 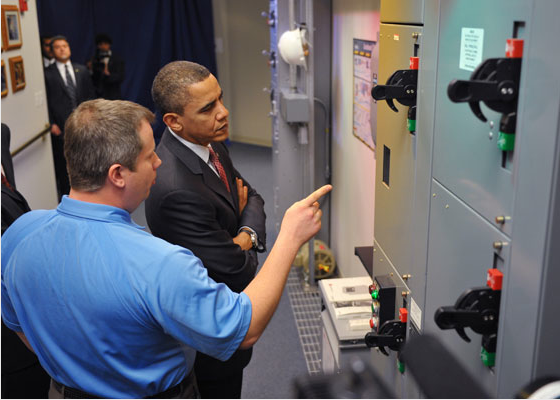 * Rep. John Shimkus, candidate for House Energy Committee chair in the new Congress, explains why we don’t have to worry about climate change. New Jersey governor and potential presidential candidate Chris Christie frets that it’s all just so complicated. * According to the International Energy Agency World Energy Outlook peak oil happened in 2006. So there’s that. * From now on, every time you say “It’s on like Donkey Kong” you have to give Nintendo a quarter. * Holy crap: what hospitals do with foreskins. Via Kottke. * Child abuse at 0% in lesbian households. You read that right. * What I didn’t see was a party that supports single-payer health care, free universities, the redistribution of wealth from the top one percent, an end to corporate-owned elections. I also want a party that hopes to abolish the death penalty, the internal combution engine and the U.S. Senate, an anti-democratic body that should go the way of the House of Lords. My friend and sometime editor David Fellerath quits the Democratic Party. * Only the super-rich can save us now: PNC Bank Will No Longer Fund Mountain Top Removal. * Ad the co-chairmen of the Catfood Commission has returned from hibernation with a triumphant plan to fix the deficit that absolutely no one likes, not even the other members of the Commission itself. Tagged with 1960s, academia, Bill Murray, Catfood Commission, child abuse, Chris Christie, circumcision, climate change, coal, Democrats, Donkey Kong, ecology, film, foreskins, John Shimkus, lesbocracy, Moon Rise Kingdom, New Jersey, Nintendo, only the super-rich can save us now, Peak Oil, politics, religion, Republicans, Social Security, Stanley Fish, the humanities, trademark, Wes Anderson, Won't somebody think of the children? * 15 classic science fiction and fantasy novels that publishers rejected. Really surprising list. * Terry Tempest Williams visits the Gulf. * In a series of recent findings, researchers describe bacteria that communicate in sophisticated ways, take concerted action, influence human physiology, alter human thinking and work together to bioengineer the environment. * The Old Man and the UC. See also. 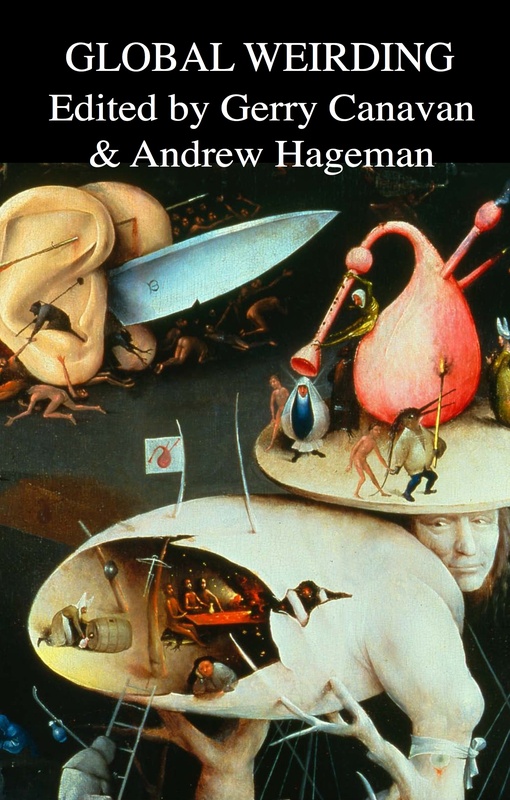 Language Log and zunguzungu have must-read critiques of Stanley Fish’s latest swan-song for the humanities. Tagged with academia, How the University Works, neoliberalism, Stanley Fish, the humanities, Who is going to pay the salary of the English department? * Al Gore is coming to Duke this April. * Arbitrarily defined political, social, and religious positionalities correlate with a measurement that doesn’t mean anything to prove people like me are smarter than everybody else. Science! 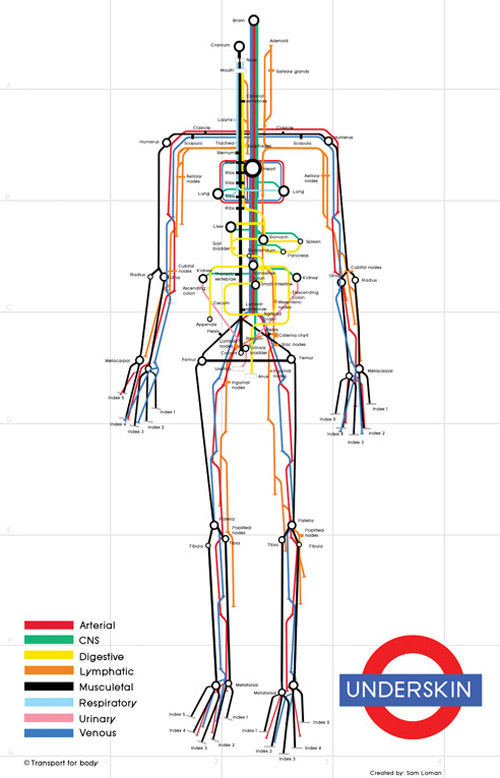 * For the doctors in the audience: A transit map of the human body. * John Roberts, radical. Via MeFi. For the past few years, I’ve been giving Roberts the benefit of the doubt, hoping that he meant it when he talked about the importance of putting the bipartisan legitimacy of the Court above his own ideological agenda. But, while Roberts talked persuasively about conciliation, it now appears that he is unwilling to cede an inch to liberals in the most polarizing cases. If Roberts continues this approach, the Supreme Court may find itself on a collision course with the Obama administration–precipitating the first full-throttle confrontation between an economically progressive president and a narrow majority of conservative judicial activists since the New Deal. * This note shows that the aggregate fiscal expenditure stimulus in the United States, properly adjusted for the declining fiscal expenditure of the fifty states, was close to zero in 2009. While the Federal government stimulus prevented a net decline in aggregate fiscal expenditure, it did not stimulate the aggregate expenditure above its predicted mean. In other words, the federal stimulus primarily covered shortfalls in state budgets; it wasn’t new spending. * Congratulations, Senate Republicans, on another historic benchmark. * Another day, another set of outrageous lies from Fox News. * Another academic career ruined by Facebook? * Health care, they say, by Easter. Thirty-six Senators now support the reinserting the public option through reconciliation; here’s how they can bring it to a vote. Meanwhile, in the House, Pelosi only needs 216 votes. It’s still being reported that the House will act first. * Steve Benen has a list of the additional Republican ideas that Obama now wants in the health care bill. I’m certain they now hate these ideas too. Quick, call a summit! * On Nicole Kidman’s pre-existing conditions. * When Sartre wrote for Hollywood. * What Smith and [Stanley] Fish are doing is asking a stupid question — where are the Orders of the Cosmic Dictator? — and failing to note that there seems to be no evidence of a cosmic dictator, and his orders are merely pretenses put up by institutionalized frauds. And then they run about in circles, flailing their arms and screaming at the people who point out that there are no orders. * How to resign from the Catholic Church. * Lost landscapes of Detroit. 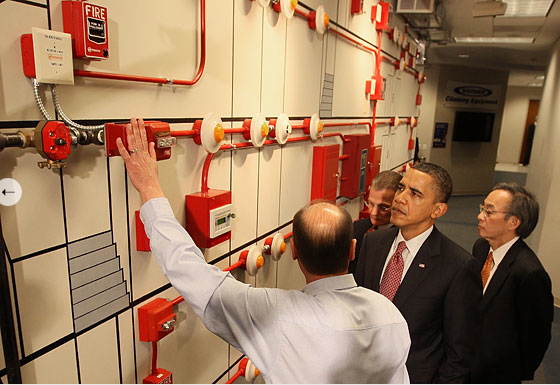 * A History of Obama Feigning Interest in Mundane Things. * Globalization, as seen through your taco. * Rejoice: marriage equality in DC tomorrow. * And please, leave Indy alone. Tagged with academia, Al Gore, atheism, Barack Obama, bipartisanship is bunk, Catholicism, climate change, Detroid, Duke, ecology, Facebook, film, Fox News, Freud, George Lucas, globalization, health care, House of Representatives, Indiana Jones, IQ, John Roberts, lies and lying liars, maps, marriage equality, medicine, Nancy Pelosi, Nicole Kidman, photographs, politics, pre-existing conditions, public option, recession, reconciliation, religion, Republicans, Sartre, Stanley Fish, stimulus package, Supreme Court, tacos, the filibuster, the Senate, Washington D.C.